Throughout its history, POET found answers to the many challenges it faced by looking inward. It all began with the resurrection of a bankrupt ethanol plant in Scotland, SD in 1987. The plant rapidly expanded and led to the creation of a company to build new plants. Broin Companies, now known as POET, pushed the limits both of constructing state-of- the-art ethanol production facilities at a reasonable cost and, once built, managing them cooperatively and efficiently. A consistent theme of Broin Companies’ success with renewable fuels has been a unique ability to identify opportunities others miss, then having the courage to create the means to secure those opportunities. The need for marketing was clear. However, when looking at marketing companies, says Broin, he found an industry whose members were mostly trying to take business from each other in current markets. No one was truly trying to build the market. So Broin set out to do it in-house. Broin Companies would do its own marketing for the ethanol plants it built and managed. It would build and “prime” new markets so that plant startups would not have a major impact on prices, sometimes for extended periods, as he had seen in the past. “I remember we gave up a significant portion of the profit we made building the first plant because of the market price impact it had on our Scotland facility,” says Broin. Along with the original company structure that integrated plant construction and production management into a Broin corporate culture, marketing provided a consistent, smart support for plants through start-up and beyond. “By keeping grain buying, ethanol marketing and coproduct marketing in house, we had control of our profit margin, which is critical in my opinion. You could say the right hand knew what the left hand was doing, which was not true of many of our competitors,” Jeff Broin says. Marketing ethanol required a new name and a marketing director. Jeff Broin and Bob Scott had known each other for several years. At an American Coalition for Ethanol (ACE) board of directors meeting in Benson, MN, Scott visited with Broin. Whatever misperceptions some motorists and fuel dealers had about ethanol, it was a fortunate time to sell it. The major oxygenate in the country’s gasoline supply, methyl tertiary butyl ether (MTBE), had begun showing up in groundwater in 1996 following leaks. Ethanol stood out as the only alternative oxygenate that was required in gasoline to replace such a contaminant. Still, Scott found much of his job involved countering misconceptions rooted in socalled common knowledge about ethanol. Oil industry resistance to ethanol was also prevalent in Washington, D.C., in state legislations and even at retail gas stations. “The oil industry will do almost anything, including mislead the public, to protect their market,” Jeff Broin said. “Some [pipeline terminal] locations had good dealers,” Scott says. He remembers dealers who would install an ethanol tank near the gasoline terminal. “The semi tankers would get gasoline then go across the street and splash blend it [10% ethanol] themselves.” Today terminals have the ethanol available at the same location as the gasoline. At the start of the 21st Century, ethanol’s proponents were individually taking steps to advance its use, but collectively the weight of their efforts was having only a modest impact on growing the industry. Broin would need to do more. After concluding two decades working for Koch Industries in Wichita, KS, including as a division manager, Bob Casper was vibrating with a recently gained knowledge about the potential of ethanol and distraught because no one else seemed to share his vision for building new ethanol markets. Casper did extensive research and became convinced ethanol could compete with petroleum in the fuel market. And Jeff Broin was the visionary Casper needed to make this marketing dream a reality. The duo decided to make it official. In August 2000, Ethanol Products advanced to a limited liability partnership and relocated to Wichita, KS, with Casper becoming president. New team members were added and the mission of the division was expanded. “It really took off,” says Scott. 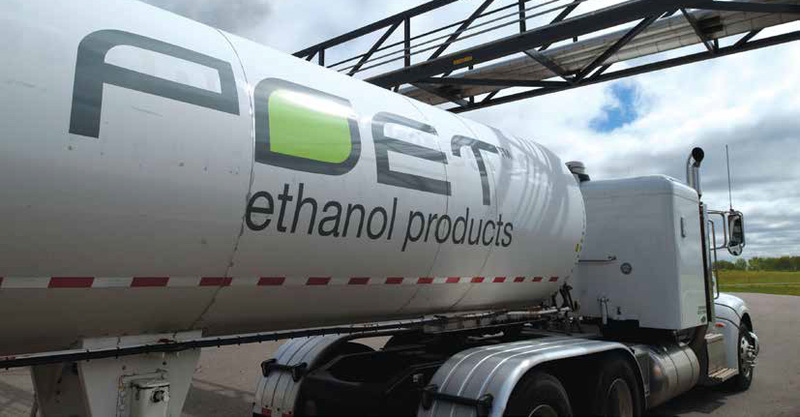 Casper immediately set sights on bringing ethanol to the St. Louis market, which used reformulated gasoline and was in need of a replacement for MTBE. “We did a deal with Shell to blend ethanol into its gasoline. BP was next. After that, everybody had to get into ethanol. They couldn’t compete [against ethanol] with MTBE,” Casper says. He repeated the strategy market-by-market across the country. In the first decade of this century, ethanol quickly took 10 percent of the gasoline market from oil companies. Once they realized it, the oil companies steadfastly tried to constrain the growth of biofuels. The ethanol industry has proven itself in spite of false oil industry claims that corn used for biofuels is taken from the food supply. It survived the Great Recession and an unprecedented run-up in corn prices, and it continues to fend off oil company attempts to roll back the federal Renewable Fuel Standard. “New information has been getting out that ethanol is a better fuel than many understood,” Casper says. A marketing company, which began with Broin, Casper and seven other people Casper was able to lure from Koch Industries at the onset, has grown to about 150 team members. It has evolved into managing POET Grain, running the corn buying division for POET, as well as marketing carbon dioxide and denaturant. “We operate over 100 tractor trailers and lease more than 2000 rail cars on a continuous basis,” says Broin. Lenders at the time were requiring co-product marketing proposals, as well. Jeff knew co-products were a critical component of income for the biorefineries, including the high protein livestock feed Dried Distillers Grain with Solubles (DDGS), and later CO2 and corn oil. In the early years, Dakota Commodities was formed to market the DDGS Broin plants were producing on a regional basis, eventually expanding to a nationwide, then worldwide market. The product was trademarked Dakota Gold and defined and advertised as a premium distillers grain in both color and quality. “Our golden color was better than anyone in the industry and we used that to differentiate and market the product,” he says. A marketing effort that began with two people has grown to 50, Broin says. Today, POET Nutrition sells 9 billion pounds of DDGS and 550 million pounds of corn oil around the world annually. It sends 100 car unit trains to California and Mexico on a regular basis, as well as serving markets in Asia, South America, Africa and the Middle East. A key aspect of developing markets for products like DDGS was research that proved their value. The Dakota Gold Research Association (DGRA) began with one then eventually three fulltime researchers in 2002. Working with university and industry colleagues and funding their research, Broin nutritionists were able to demonstrate Dakota Gold DDGS was a valuable addition to the feed rations of dairy and beef cattle and DGRA opened new major markets in both the swine and poultry industries. In a very short period of time, “he broke worldwide fermentation records by 30%,” Broin says of Lewis’ impact on the enzyme and yeast technology that drives fermentation of corn starch into ethanol. “Today, we have the most comprehensive research system in the history of ethanol, employing over 60 people while also operating two pilot plants, one for starch-based and one for cellulosic ethanol production.” The Scotland plant, now named POET Research Center, also plays a key role in proving new technologies. Broin Companies’ involvement in the ethanol industry was characterized, from its beginning to its evolution into POET today, by its drive for innovation and quality. The company has impacted the world through not only its development of marketing ethanol production technology, but also through ethanol fuel and ethanol co-products.